YCLP empowers student leaders to speak out on social justice and education issues, becoming catalysts for change as they fight for the resources needed to prepare for college and sustainable careers. 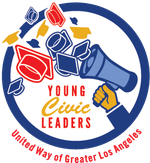 The Young Civic Leaders Program (YCLP) is a leadership development program created by United Way of Greater Los Angeles to give LAUSD high school students the opportunity to speak out on the education issues that affect their communities and schools. Student input helped shift $30M of LAUSD's budget toward counseling support for historically underserved students. In 2014, students launched the L.A. Youth Vote initiative, which engaged more than 3,000 students on the importance of voting in local school board elections. We partnered with YVote to register 1,500 high school students to vote before the March 7 L.A. primary election. Are you a high school student who cares about the community? A student who cares about civil rights and activism? Join the Young Civic Leaders Program today and help improve the quality of education for all students in Los Angeles!